A brilliant final afternoon saw Willie Mullins wrestle back the trainers' championship helped by the success of Bapaume. The 2/1 chance finished a length and a quarter clear of Landofhopeandglory with Mega Fortune, representing Mullins' championship rival Gordon Elliott, coming fourth. "I think we got the tactics right," said Mullins. "We thought Mega Fortune was the one to track and it worked out. 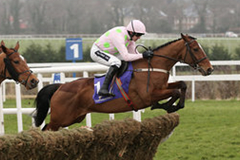 Bapaume has kept his form well all season and is a fantastic horse. "I imagine he'll stay over hurdles next season although it can be tough in the second season."